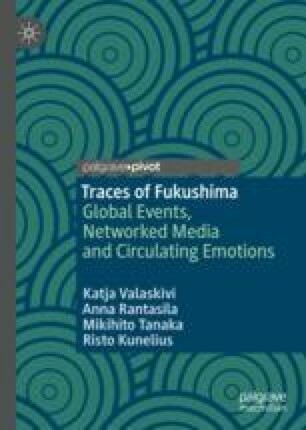 This chapter examines the role of experts and expertise in the news coverage of Fukushima Daiichi disaster by the Finnish broadcasting company Yleisradio (YLE) between March 2011 and December 2016. The chapter analyses both YLE’s news coverage and online comments about the news of Fukushima Daiichi. Reflecting findings from previous studies on perceptions on nuclear energy, expertise and affect, this chapter argues that experts often become nodal points of discussion that become sticky with affect. Moreover, the presence of sticky figures such as the experts appears to influence affective dynamics of online comments by often dividing the commenters into opposing positions. Energiateollisuus. (2016). Ydinvoiman kannatuksen kehitys 1983–2015. Development of the acceptance of nuclear power 1983–2015. Energiateollisuus ry. https://energia.fi/ajankohtaista_ja_materiaalipankki/materiaalipankki/ydinvoiman_kannatuksen_kehitys_1983_2016.html. Accessed 9 Sept 2018. Fennovoima. (2018). The story of Fennovoima. https://fennovoima.fi/en/fennovoima/story-of-fennovoima. Accessed 28 Aug 2018.
International Atomic Energy Agency. (2018). Country nuclear power profiles: Finland. https://cnpp.iaea.org/countryprofiles/Finland/Finland.htm. Accessed 18 Mar 2019. Teollisuuden voima. (2018). Olkiluoto 3. https://www.tvo.fi/OL3. Accessed 20 Dec 2018. Yle Uutiset. (2010). Kommentoidaan! [Let’s comment!] 29.1.2010, AM 10.34. https://yle.fi/uutiset/3-5431326. Accessed 22 May 2018.